Background Respiratory management of obesity hypoventilation syndrome (OHS) focusses on the control of sleep-disordered breathing rather than the treatment of obesity. Currently, there are no data from randomised trials of weight loss targeted rehabilitation programmes for patients with OHS. Intervention A 3-month multimodal hybrid inpatient–outpatient motivation, exercise and nutrition rehabilitation programme, in addition to non invasive ventilation (NIV), would result in greater per cent weight loss compared with standard care. Methods A single-centre pilot randomised controlled trial allocated patients to either standard care or standard care plus rehabilitation. Primary outcome was per cent weight loss at 12 months with secondary exploratory outcomes of weight loss, exercise capacity and health-related quality of life (HRQOL) at the end of the rehabilitation programme to assess the intervention effect. Results Thirty-seven patients (11 male, 59.8±12.7 years) with a body mass index of 51.1±7.7 kg/m2 were randomised. At 12 months, there was no between-group difference in per cent weight loss (mean difference −5.9% (95% CI −14.4% to 2.7%; p=0.17)). At 3 months, there was a greater per cent weight loss (mean difference −5% (95% CI −8.3% to −1.4%; p=0.007)), increased exercise capacity (6 min walk test 60 m (95% CI 29.5 to 214.5) vs 20 m (95% CI 11.5 to 81.3); p=0.036) and HRQL (mean difference SF-36 general health score (10 (95% CI 5 to 21.3) vs 0 (95% CI −5 to 10); p=0.02)) in the rehabilitation group. 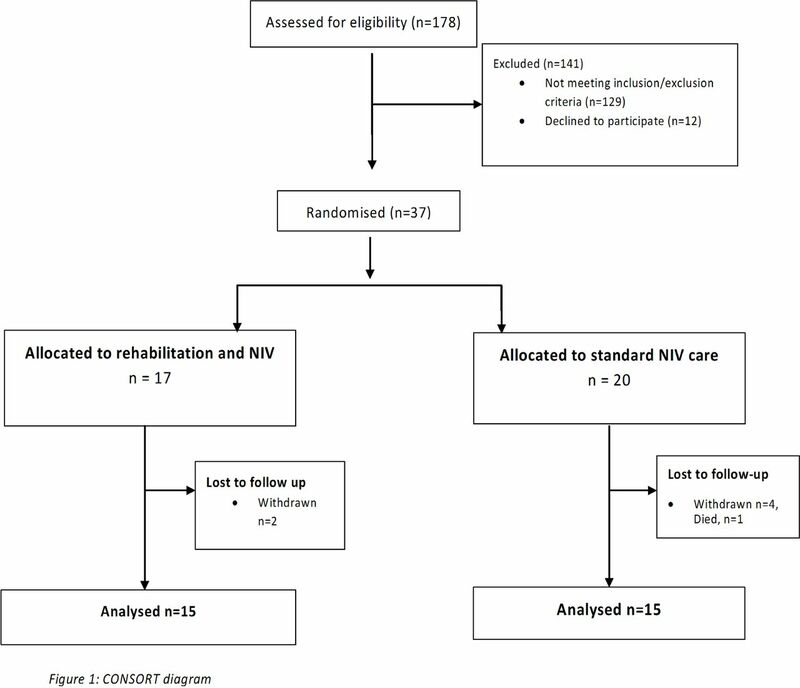 Conclusion In patients with OHS, a 3-month comprehensive rehabilitation programme, in addition to NIV, resulted in improved weight loss, exercise capacity and QOL at the end of the rehabilitation period, but these effects were not demonstrated at 12 months, in part, due to the limited retention of patients at 12 months. Trial registration number Pre-results; NCT01483716. Does a hybrid inpatient–outpatient motivational interviewing-based, nutrition and exercise programme enhance weight loss at 12 months in patients with obesity hypoventilation syndrome treated with non-invasive ventilation? The addition of a rehabilitation programme to non-invasive ventilation had no significant effect on per cent weight loss at 12 months. This single-centre pilot randomised controlled trial investigating the effect of a 3-month multidisciplinary rehabilitation programme failed to demonstrate sustained weight loss at 12 months; however, the addition of rehabilitation to standard care resulted in a reduction in weight, improvement in exercise capacity and enhanced health-related quality of life at the end of the 3-month rehabilitation programme. OHS is now the the most common indication for home mechanical ventilation (HMV) in England and elsewhere in Europe.13 14 The current treatment with HMV focusses on relief of sleep-disordered breathing and subsequent reversal of chronic respiratory failure rather than addressing the underlying issue of obesity. Indeed, reduction in weight should be considered the most important target in the respiratory management of obesity as sufficient weight loss has been shown to enhance respiratory, cardiovascular and metabolic outcomes as well as improving sleep-disordered breathing.15 16 Initiation of HMV in OHS has been associated with a reduction in weight and improvement in daytime activity that may be enhanced with the addition of targeted multidisciplinary input.17 18 We hypothesised that a multidisciplinary hybrid inpatient–outpatient exercise and nutritional rehabilitation programme, in addition to non invasive ventilation (NIV), would result in a greater per cent weight loss in patients with OHS than NIV alone at 12 months. The study was approved by Westminster National Research Ethics Committee (11/LO/48) and prospectively registered on clinicaltrials.gov (NCT01483716) and by the National Institute for Health Research UK Clinical Research Network (UKCRN 11778). The study screened for eligible consecutive patients referred to the Lane Fox Respiratory Service, St Thomas’ Hospital, London, UK, for consideration of non-invasive ventilation for OHS between 1 January 2012 and 16 August 2015. Study inclusion criteria included the diagnosis of OHS (evidence of sleep-disordered breathing; daytime hypercapnia (PaCO2 >6 kPa); BMI >30 kg/m2); FEV1/FVC>0.7; age >18 years and tolerated NIV for >4 hours at NIV initiation. Subjects were excluded if they had persistent decompensated hypercapnic respiratory failure (pH <7.3); acute hypercapnic respiratory failure managed with invasive mechanical ventilation at index presentation; clinically significant neuromuscular, chest wall or airway disease contributing to hypercapnic respiratory failure; unstable coronary artery disease; cognitive impairment that would prevent informed consent or the inability to comply with protocol; psychiatric disease necessitating antipsychotic medication, ongoing treatment for drug or alcohol addiction, no fixed abode; need for long-term renal replacement therapy; a coexisting diagnosis of active cancer or critical peripheral vascular disease. Eligible patients were randomised 1:1 to either standard care (NIV; control arm) or standard care plus rehabilitation (NIV plus rehabilitation; intervention arm). Randomisation was provided by the King’s Clinical Trials Unit which operated an online randomisation service (V.1.4.1), with minimisation based on neck circumference (NC) (<45 or ≥45 cm), BMI (30–39, 40–49, 50–59 or >60 kg/m2) and gender (male/female). Due to slower than anticipated recruitment, poor 12-month patient retention and availability of trial personnel to conduct the rehabilitation programme, the data monitoring and safety committee (DMC) were convened to review the interim 3-month analyses. The recommendation from the DMC was to suspend recruitment and conduct a full analysis of the data. Patients randomised to the standard care arm received NIV set-up according to standard clinical care. In brief, patients were admitted and underwent daytime acclimatisation to NIV via oronasal mask. Patients unable to tolerate oronasal masks were offered nasal or total face masks. An overnight titration according to a standardised protocol was implemented with the aim of abolishing upper airway obstruction and ameliorating nocturnal hypoventilation.19 Patients received a standard UK Department of Health ‘Change for Life’ nutritional and exercise advice leaflet (http://www.nhs.uk/change4life/Pages/change-for-life.aspx). Following discharge the research team contacted patients with a once-weekly telephone call to ‘troubleshoot’ any ventilator issues. NIV was introduced as per standard clinical care described above; at this time a bespoke rehabilitation programme was introduced. The rehabilitation team consisted of rehabilitation physiotherapist, respiratory physician and dietician. The programme was designed by the team as a hybrid inpatient–outpatient nutrition and educational programme. Patients underwent an initial motivational interviewing session in conjunction with physiotherapy and dietetic review to formulate a personal exercise and dietary plan for a 3-month period (online supplementary table E1). The programme was augmented by multidisciplinary monthly review to reset goals and optimise intervention. Weekly phone calls were used to maintain motivation and focused on exercise, nutrition and weight loss. Measurements were performed at baseline, 3 months and 12 months. Primary outcome was change in weight expressed as percentage weight change from baseline to 12 months. Weight was measured using bariatric scales (Seca-Digital, Hamburg, Germany) for those that weighed up to 150 kg and seated scales (MP DC-250, Marsden, Oxfordshire, UK) for those that were >150 kg. The same weighing scales were used for each subject at each visit. Patients underwent measurements of weight, NC, chest circumference (CC), waist circumference (WC), hip circumference (HC) and thigh circumference according to WHO guidance.20 Bio-electrical impedance (Bodystat 1500, Bodystat, Douglas, Isle of Man) was used to calculate fat free mass. Arterial blood gas analysis was performed with the patient in the seated position rested for at least 1 hour during the day (Roche, Mannheim, Germany) while breathing room air. Patients underwent an overnight diagnostic sleep study involving oximetry and transcutaneous carbon dioxide monitoring (TOSCA, Radiometer, Copenhagen, Denmark) prior to treatment at baseline, to titrate the NIV during set-up and at the 3-month follow-up visit. Physical activity was assessed objectively by wrist-worn accelerometry (Actiwatch Spectrum, Philips, Murrysville, Pennsylvania, USA) and subjectively with the Dukes activity status index (DASI; a 12-point questionnaire that provides an estimate of peak VO2 max). Actigraphy monitoring was performed in the 2 weeks post discharge and 2 weeks prior to the 3-month assessment only. Patients wore the monitor for the whole 2-week period, as described previously, to objectively assess daytime activity level.17 Exercise and functional capacity were assessed using the 6 min walk test (6MWT), sit-to-stand 60 (the number of times a patient could stand up and sit back down in 60 s) and timed-up-and-go (TUAG time taken to stand and walk 3 m). Health-related quality of life (HRQOL) was measured using the Severe Respiratory Insufficiency (SRI) questionnaire,27 RAND Short-Form 36 (SF-36), the Illness Perception Score,28 Epworth sleepiness scale, Hospital Anxiety and Depression Scale and Medical Research Council Breathlessness score. The EQ-5D-5L was used to provide health economic data. Data from the internal ventilator log were used to assess hours of use for each patient during the trial period. An a priori hypothesis was set to detect an absolute 5% difference in per cent weight loss between the two groups at 12 months. Using the data from Murphy et al,17 a sample of 60 patients (30 in each arm) was required to detect this difference at 90% power with 5% significance. Data are presented as medians (IQR) unless otherwise stated with an intention-to-treat analysis performed. Analysis of covariance was used to detect between-group differences. The Wilcoxon signed-rank test or paired t-test were used as appropriate to detect within-group differences. Simulations based on bootstrapping and Monte Carlo analysis were used to increase confidence in the estimated treatment effect following the intervention at 3 months. The EQ-5D-5L was used to determine utility scores and to perform cost-effectiveness and cost–utility analyses at 3 months. Multiple imputation using chained equations was employed to account for the missing data. Non-parametric bootstrap resampling technique was employed to assess the uncertainty around the cost-effectiveness. 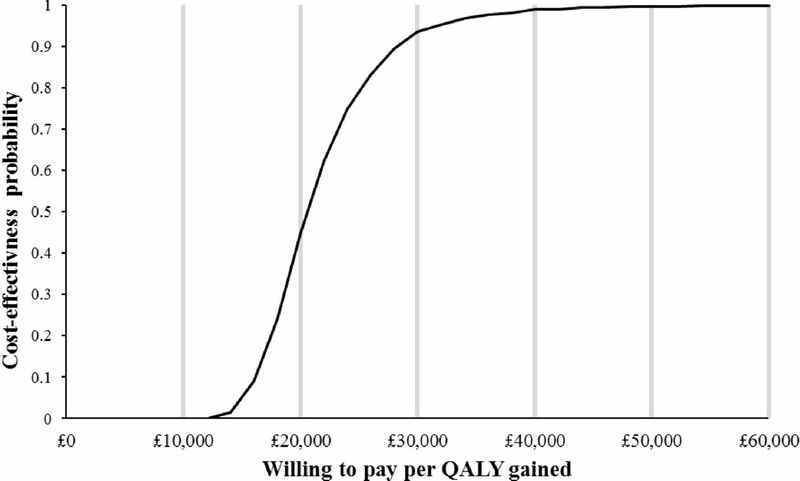 The cost-effectiveness acceptability curves were evaluated to express the likelihood that intervention is cost-effective given different thresholds of willingness to pay. In total, 178 patients were screened for study inclusion with 37 patients recruited (figure 1). Due to a slower than anticipated recruitment rate, the trial DMC was convened on 20 October 2014 to review preliminary results (3-month end of rehabilitation data) and assess trial feasibility. The DMC determined that the trial should be terminated early for pragmatic and safety reasons, in particular, the safety of continuing the trial without funding and infrastructure for a dedicated clinical research team to perform the rehabilitation programme. Recruitment was suspended with 37/60 patients enrolled. Table 1 shows the baseline data at trial entry. At 12 months, there were data available for only 18 patients from the 37 patients initially recruited (8 patients in the control group and 10 patients in the intervention group). There was no difference in per cent weight loss observed between the two groups (mean difference −5.9% (95% CI −14.4% to 2.7%; p=0.17)). From baseline, there was a trend towards absolute weight loss at 12 months in the intervention group (∆−9.8 kg weight loss from baseline; p=0.08) with no such trend observed in the control group (∆−0.4 kg from baseline; p=0.74). Again, there was no difference observed between the groups (mean difference −9.4 kg, 95% CI −23.5 kg to 4.6 kg; p=0.17). At 3 months, patients receiving rehabilitation in addition to NIV demonstrated loss in body weight of 7.0% (95% CI −9.9 % to −4.5%, p=0.0003) compared with 2.0% (95% CI −4.7% to 0.1%, p=0.56) in patients receiving NIV alone (table 2). There was a mean difference of −5% (95% CI −8.3% to −1.4%, p=0.007) weight change between the groups favouring the rehabilitation group. The rehabilitation group demonstrated superior improvements in anthropometric measures compared with the standard care group at 3 months (table 2). Absolute weight (9.6 kg vs 3.0 kg; p<0.05) and BMI (3.5 kg/m2 vs1 kg/m2; p<0.05) had a greater reduction in the intervention group than the control group. The intervention arm was associated with weight loss that was demonstrated to be reduction in absolute fat mass (change in fat mass: rehabilitation −6.2 kg, 95% CI −10.5 to −4.0 kg, p=0.003; control 0.9 kg, 95% CI −3.9 to 11.1 kg, p=0.25; between-group difference −9.44 kg, 95% CI −15.0 to −3.92 kg, p=0.002). See online supplementary tables E7 and E8. There were improvements in PaCO2 and HCO3 following HMV initiation as expected (online supplementary table E2). Both groups demonstrated similar control of sleep disordered breathing and management of chronic respiratory failure. Rehabilitation intervention demonstrated within-group improvements in estimated VO2 peak (using DASI), STS and TUAG that were not present in the control group; there was no difference between the groups (table 3). Both groups demonstrated improvements in 6MW distance, but rehabilitation intervention demonstrated a greater increase in 6MW distance (control vs intervention 20 (95% CI 11.5 to 81.3) vs 60 (95% CI 29.5 to 214.5) m; p=0.036) (table 3). There was only a trend towards decreased immobile time in the intervention group compared with the control group (see online supplementary table E3). Furthermore, the increase in exercise capacity and physical activity was coupled with improvements in muscle size in the intervention group compared with the control group (RFCSA at 2/3 distance mean difference (95% CI) 167 mm2 (25 to 309); p=0.02) and strength improved in the intervention group only (Δ change baseline to 3 months: QMVC/weight 0.01 AU (−0.02 to 0.04) vs 0.03 AU (0 to 0.1), p<0.05); mean handgrip/weight (−0.06 AU (−0.15 to 0.4) vs 0.01 AU (−0.07 to 0.1), p<0.05) (see online supplementary table E4). There were improvements in the SF-36 physical component score (PCS) in the intervention group with between-group difference in SF-bodily pain and SF-general health with greater improvements observed in the intervention group (table 4). In addition, there were within-group differences in several SRI subscales in the intervention group (table 5) and a between-group difference in the SRI anxiety and respiratory component subscales. There were no differences in NIV use at 3 months (standard care vs intervention 3.2 hours (1.16–5.23) vs 4.4 hours (3.48–6.33); p=0.5). The health economic analysis is available in the online supplementary tables E5 and E6, figure 2. Cost-effectiveness acceptability curve. QALY, quality-adjusted life-year. This single-centre pilot randomised controlled trial investigating the effect of a 3-month multidisciplinary rehabilitation programme, implemented during inpatient initiation of non-invasive ventilation, failed to demonstrate sustained weight loss at 12 months in obese patients with chronic respiratory failure. However, the addition of rehabilitation to standard care demonstrated significant reduction in weight, improvement in exercise capacity and enhanced HRQOL compared with standard care at the end of the 3-month rehabilitation programme. A major limitation of the study was the failure to recruit to the prespecified target. The power of the trial was further compromised by the low level of patient retention, which thus negatively impacted on the ability to determine the between-group difference in the primary outcome at 12 months. This low recruitment and retention was unexpected as previously we have recruited, and retained, obese patients to non-invasive ventilation trials in a timely manner17 and indeed we have already recruited 55% of the patients required for another trial investigating the cost-effectiveness of outpatient NIV set-up in patients with OHS.29 The early termination of the trial was advised following the DMC review. This decision to terminate was supported by the Trial Steering Committee based on the concerns regarding patient recruitment and retention at 12 months but with the order to analyse the data at 3 and 12 months. Despite these caveats, these pilot data will inform future trial design and have demonstrated the feasibility of acceptance of rehabilitation in patients with OHS which is in contrast to previous reports.29 Patient retention when enrolled in the rehabilitation programme itself was wholly in line with drop-out rates reported from other trials recruiting obese patients with chronic respiratory failure.17 30 Furthermore, these data confirm that the addition of rehabilitation to HMV does not increase drop-out rate from the intervention group but that recruitment to such an intervention is challenging. However, the problem of long-term retention and follow-up of patients after completing rehabilitation will need addressing in a future study. There are important observations from this single-centre pilot randomised controlled trial in terms of the time of measurement of the primary outcome. We have shown that delivery of the 3-month rehabilitation intervention was achievable and effective as an inpatient–outpatient hybrid model. Specifically, it is important to highlight, as part of our assessment of the intervention effect, that at 3 months there was a between-group difference observed in both per cent and absolute weight loss, exercise capacity and HRQOL in favour of the intervention group. There may, therefore, be important beneficial effects of a 3-month rehabilitation programme in patients with OHS, although these effects may not be long term. It is increasingly recognised that the management of OHS must include consideration of the comorbid conditions.18 31 This pilot study is the first randomised controlled trial that has delivered a hybrid inpatient–outpatient multidisciplinary rehabilitation programme in addition to non-invasive ventilation in obese patients with chronic respiratory failure. This approach was based on our own previous observation that treatment of chronic respiratory failure with non-invasive ventilation was associated with weight loss and a decrease in sedentary time.17 There have been no previous randomised controlled trials investigating the effect of a rehabilitation programme in patients with chronic respiratory failure and the only previous data available are from eucapnic obese patients with and without obstructive sleep apnoea, which needs to be extrapolated with caution. Indeed, data from patients with eucapnic OSA treated with CPAP demonstrated an increase in weight following CPAP treatment initiation. This gain in weight with CPAP initiation has been demonstrated in a sham-controlled trial32 as well as reported in a recent meta-analysis.33 Interestingly, and in contrast to the data in obese patients with chronic respiratory failure starting non-invasive ventilation,17 34 the initiation of CPAP therapy in patients with eucapnic OSA has not been shown to improve daytime physical activity.35 This lack of effect in enhancing exercise capacity and physical activity with CPAP treatment is further highlighted by the data from Masa and colleagues, who demonstrated improved exercise capacity and weight loss in obese patients with chronic respiratory failure treated with non-invasive ventilation, but not in those patients randomised to CPAP therapy.34 The current data have demonstrated that the treatment of sleep-disordered breathing in combination with the delivery an effective rehabilitation programme may augment weight loss, increase exercise capacity and enhance HRQOL at 3 months. The failure to sustain the weight loss at 12 months may, in part, be due to underpowering but could also indicate the need for ongoing support required to achieve long-term benefits. The rehabilitation intervention employed was a bespoke approach that was tailor-made to the needs of the patient and modelled using motivational interviewing as part of a personalised medicine programme. This is in contrast to the usual didactic and negatively framed approach and instead explores and challenges the patient’s underlying behaviours and focusses on an internally derived model for change.39 Although the use of a bespoke programme requires input from a team of skilled multidisciplinary team, the modelling performed demonstrated it to be potentially cost-effective, at a threshold of £30 000 per QALY gained. The cost involved by delivery of the intervention was offset by the significant improvements in quality of life (online supplementary material). This single-centre pilot randomised controlled trial investigating the effect of a 3-month multidisciplinary personalised hybrid inpatient–outpatient nutrition and exercise programme rehabilitation programme in obese patients with chronic respiratory failure demonstrated major challenges of recruiting patients with OHS to a rehabilitation programme as well as problems with long-term retention beyond completion of the programme. However, if patients can be enrolled, these data may support a beneficial effect of the rehabilitation programme in terms of enhanced weight loss with improved exercise capacity and HRQOL at the end of the programme. Triona Joyce, Sadie Chentouf, Alice Champion, Soraya Barratt, Helen Dady were all involved in delivering the motivational interviewing rehabilitation to patients. Dr Fionnuala Crummy at UCLH and Dr Amit Patel at Whittington Hospital for assisting in recruiting patients. NHS Information Centre. Statistics on obesity, physical activity and diet: England, 2010. London: The Health and Social Care Information Centre, 2010 http://content.digital.nhs.uk/catalogue/PUB00206/obes-phys-acti-diet-eng-2010-rep.pdf.
. Tackling obesities: future choices. 2012 https://www.gov.uk/government/collections/tackling-obesities-future-choices (accessed Sept 2017).
. Changing patterns in long-term noninvasive ventilation: a 7-year prospective study in the Geneva lake area. Chest 2003;123:67–79. World Health Organization. STEPS manual, Part 3: training and practical guides overview, 2008. http://www.who.int/chp/steps/STEPS_Manual.pdf?ua=1.
. Diagnostic tests in the assessment of patients for home mechanical ventilation. Mark W Elliott , Stefano Nava , Bernd Schönhofer , ed. Principles and practices of non-invasive ventilation and weaning: Hodder Arnold, 2010:151–66. Contributors SM was responsible for data collection, analysis and manuscript preparation. ES, MR, BC, RH and AVF assisted with data collection and contributed to manuscript preparation. AD and TC assisted with data analysis and manuscript preparation. NH, MIP, JM, PBM, ME, DEB, HM and SAG were all involved with manuscript preparation. Funding This trial was funded by the Guy’s and St Thomas’ Charity. The Lane Fox Respiratory Service, Guy’s and St Thomas’ NHS Trust and King’s College London acknowledge the support of the National Institute for Health Research, through the Clinical Research Network. AD acknowledges financial support from the National Institutefor Health Research Biomedical Research Centre at Guy’s and St Thomas’ National Health Service (NHS) Foundation Trust and King’s College London and support from the NIHR Collaboration for Leadership in Applied Health Research and Care South London (CLAHRC South London). Competing interests ME reports personal fees from Resmed, personal fees from Phillips Respironics, MIP reports personal fees from Philips Respironics, DEB reports personal fees from Nutricia, Baxter, Fresenius Kabi and Braun, PBM reports grants and personal fees from Philips-Respironics, grants from Resmed, grants from B&D electro medical NH reports grants and personal fees from Philips and Philips-Respironics, Resmed, Fisher-Paykel, B&D Electromedical, personal fees from Astra Zeneca; in addition, NH has a patent pending for Myotrace. Other authors have no competing interest to declare. Ethics approval The study was approved by Westminster National Research Ethics Committee (11/LO/48) and prospectivelyregistered on clinicaltrials.gov (NCT01483716) and by the National Institutefor Health Research UK Clinical Research Network (UKCRN 11778).